Yesterday Cornell Tech’s campus opened on Roosevelt Island, a strip of land between Manhattan and Queens perhaps best known for housing medical institutions and mental hospitals. This development definitively stakes a new identity for the island. Created through an academic partnership between Cornell University and the Technion-Israel Institute of Technology, the project is the winner of a New York City competition for an applied-sciences campus initiated by the Bloomberg administration. The campus spans 12 acres and houses three new buildings by Morphosis, Weiss/Manfredi and Handel Architects. So far, what makes the buildings stand out is their aim to be among the most sustainable and energy efficient structures in the world. 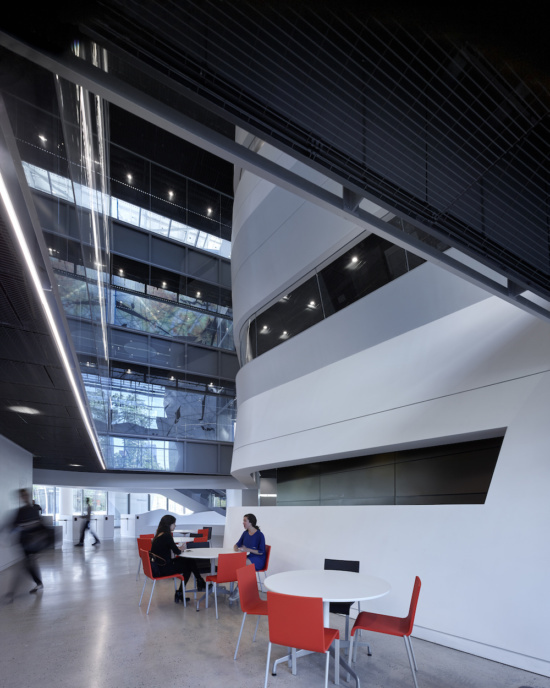 The four-story, 160,000-square-foot Bloomberg Center, designed by Morphosis Architects, serves as the heart of Cornell Tech. 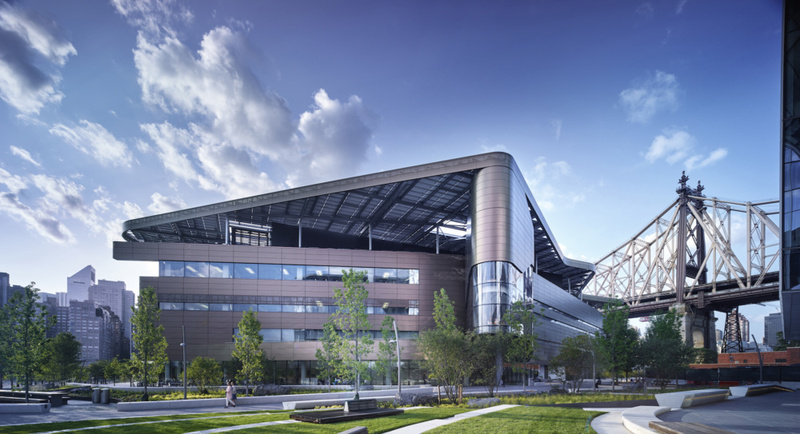 With its primary power source on-site, it is one of the largest net-zero energy academic buildings in the world. Smart building technology developed in collaboration with engineering firm Arup includes a roof canopy supporting 1,465 photovoltaic panels designed to generate energy and shade the building to reduce heat gain, a closed-loop geothermal well system for interior cooling and heating, a rainwater harvesting system to feed the non-potable water demand and irrigate the campus, and a power system conserving energy when the building is not in use. Another striking element is The Bloomberg Center’s facade, which is comprised of a series of metal panels designed to decrease the building’s overall energy demand. The Bridge, designed by Weiss/Manfredi, is a seven-story “co-location” building intended to link academia to entrepreneurship. It houses a range of companies from diverse industries that have the opportunity to work alongside Cornell academic teams. The loft-like design of the building encourages dialogue between the University’s academic hubs and tech companies. The building orientation frames full river views and brings maximum daylight into its interior. At the ground level, the entrance atrium opens onto the center of campus extending into the surrounding environment through a series of landscaped terraces. The House, designed by Handel Architects, is a 26-story, 350-unit dormitory for students, staff, and faculty. It is the tallest and largest residential passive house in the world, meaning it follows a strict international building standard to reduce energy consumption and costs. The House is clad with a super-sealed exterior facade created from 9-by-36-foot metal panels with 8 to 13 inches of insulation which are projected to save 882 tons of carbon dioxide per year. Yesterday’s opening comprises just the first phase of the campus development project at Cornell Tech.